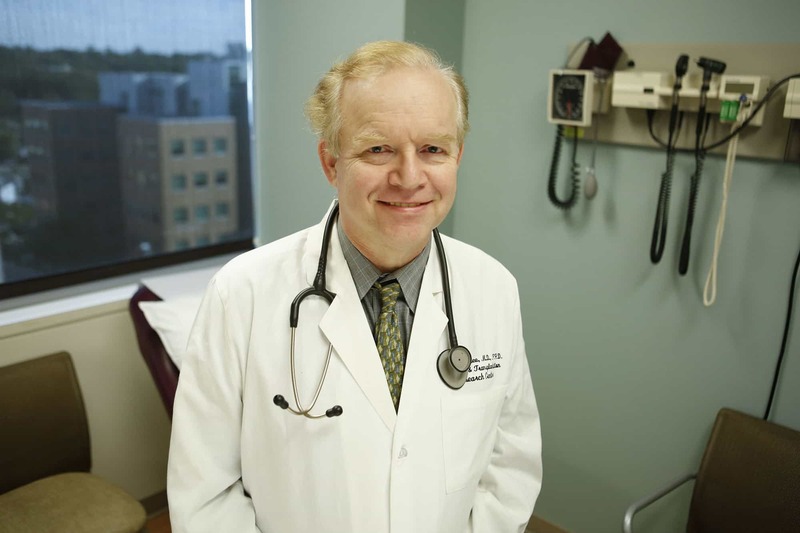 Frits van Rhee, M.D., Ph.D., a myeloma researcher and clinician at the University of Arkansas for Medical Sciences, recently led an international medical team in establishing treatment guidelines for Castleman disease, a rare disorder of the lymph nodes and related tissues. Oct. 8, 2018 | LITTLE ROCK — Frits van Rhee, M.D., Ph.D., a myeloma researcher and clinician at the University of Arkansas for Medical Sciences (UAMS), was lead author on a recently published paper that for the first time establishes treatment guidelines for patients with a form of Castleman disease, a rare disorder of the lymph nodes and related tissues. The guidelines are designed to improve outcomes in patients with a severe form of the disease called idiopathic multicentric Castleman disease (iMCD). It affects multiple lymph node areas and can cause night sweats, fevers, weight loss, anemia and in severe cases organ failure and death. “Treatment is challenging and outcomes can be poor since no uniform treatment guidelines exist, few systematic studies have been conducted and no agreed upon response criteria have been described, according to the paper published online Sept. 4 in Blood, the journal of American Society of Hematology. “International, Evidence-based Consensus Treatment Guidelines for Idiopathic Multicentric Castleman Disease” includes research and input from van Rhee and 41 other specialists, researchers, and clinicians from 10 countries. Van Rhee is regarded as an international expert on Castleman disease. He is professor of medicine and holds the Charles and Clydene Scharlau Chair for Hematologic Malignancies Research. iMCD has been treated with a wide variety of agents, including corticosteroids and chemotherapies. But many patients, especially those with a severe form of the disease, do not benefit from some of these treatments. The guidelines should assist physicians with selecting therapy and evaluating the response, thereby improving patient outcomes. Most recommendations were reached by consensus of the expert panel. They based the guidelines on published literature, review of treatment effectiveness in 344 cases, and expert opinion. They gathered through coordinated meetings of the Castleman Disease Collaborative Network, which van Rhee cofounded in 2012 with his patient David Fajgenbaum, M.D. Other UAMS researchers who helped with the project are Katie Stone, director of the Myeloma Immunotherapy Lab, and Amy Greenway, research associate with the Myeloma Immunotherapy Lab. Contributors hail from across the United States and Canada, the United Kingdom, Germany, Italy, France, Japan, Hong Kong, Norway and New Zealand. An international registry for patients with Castleman disease was established in October 2016 to collect patient outcomes to increase the evidence base for selection of future therapies. Castleman disease occurs when an abnormal overgrowth of cells occurs in the lymph system, which serves as the main part of the body’s immune system. The disease, affecting 5,000 to 6,000 patients across the nation, was identified by Benjamin Castleman, M.D., in 1954. Van Rhee was previously the principal investigator on a worldwide trial with siltuximab, which led to the first FDA-approved treatment for multicentric Castleman disease and led to the approval of the drug by the European Medicine Agency. Earlier this year, he released a book, Castleman Disease, as part of the Hematology/Oncology Clinics of North America series of clinics review articles published bimonthly by Elsevier Inc. Van Rhee wrote the chapter, “Treatment of Idiopathic Castleman Disease” along with Green, his research associate, and Stone, his lab director.